Box Text: It's up to you to defeat the Empire! This is a list of VGCollect users who have Ogre Battle 64: Person of Lordly Caliber in their Collection. This is a list of VGCollect users who have Ogre Battle 64: Person of Lordly Caliber in their Sell List. 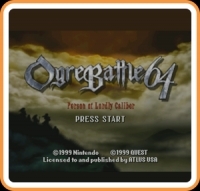 This is a list of VGCollect users who have Ogre Battle 64: Person of Lordly Caliber in their Wish List.